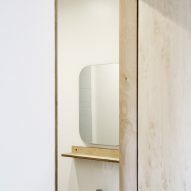 "The clients knew our style and approach," the designer told Dezeen. "Usability and low budget were the main criteria we had to deal with." 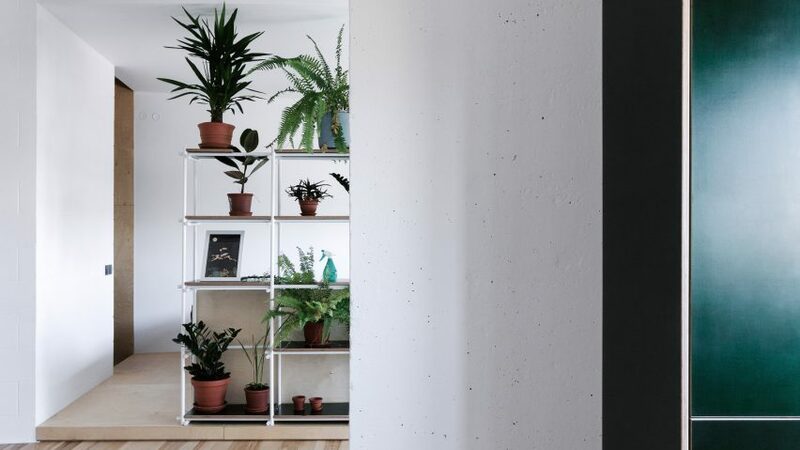 The only flashes of colour come from the new kitchen and the plant-covered partition. 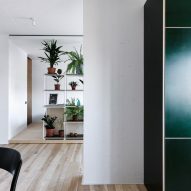 The kitchen features laminated plywood cabinetry, coloured in a shade of forest green, which Shpelyk says "creates a delicate accent and revives the interior with colour". "The materials we used in this project gave us the opportunity to create interesting texture contrasts, which enriched the interior visually" he said. "We were trying various combinations and finally chose green, as the clients liked that colour." Lined with potted plants, it offers some privacy for the bedroom area, but doesn't close it off completely. The bed is slightly raised up on a platform to offer further separation. "I would say its quite fascinating to think over every meter of the apartment and how it will be used," said Shpelyk. "In small apartments you have to think of every detail". 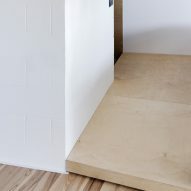 Other details include black furnishings and an ash wood floor. "We adore this type of wood," added Shpelyk.